Tarlton Law Library's Archives and Special Collections provides access to unique and valuable books, manuscripts, and photographs that document our legal, political and social heritage, and the history of The University of Texas School of Law. Students, faculty, and researchers from across Texas and around the world use our collections. 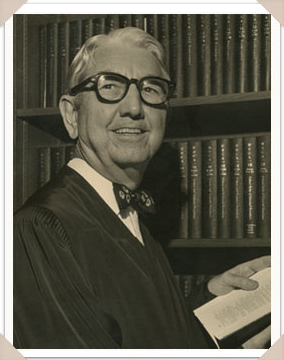 The Tom C. Clark Papers contain a comprehensive record of Justice Clark's activities as a U.S. Supreme Court Justice, public servant, and advocate for improved judicial administration. The entire collection measures 524 linear feet (869 document boxes, 20 scrapbooks, and over a thousand photographs), and most of it dates from Clark's appointment to the Supreme Court in 1949 until his death in 1977, although there is some material from his time in the Justice Department, including his service as U.S. Attorney General (1945–1949). Experts regard the Tom C. Clark Papers as one of the two most complete collections of Warren Court papers (the other being the William O. Douglas Papers at the Library of Congress). Case files, bench memoranda docket sheets, briefs, petitions, transcripts, and slip opinions describe in detail the internal workings of the Vinson and Warren Courts during Clark's tenure (1949–1967), and total over 200 linear feet of documents. Additional case records document Clark's later service as a visiting judge in federal appeals courts and district courts. Other significant portions of the Tom C. Clark Papers include his general correspondence files (56 feet), speech & travel files (59 feet), and American Bar Association files (40 feet). Scrapbooks, news clippings, printed materials, political cartoons, photographs, sound recordings, films, artifacts, and ephemera also illustrate his life as a public servant, on and off the Supreme Court. Much of these materials document Clark's work to improve judicial administration. The Tom C. Clark Papers were donated to the Tarlton Law Library by Mrs. Tom C. Clark in 1977. A detailed finding aid to the collection is available online. Almost all of Clark's papers for the years 1945–1949, when Clark was U.S. Attorney General, are at the Harry S. Truman Library, Independence, Missouri. If you publish an article, book, or essay citing the Tom C. Clark Papers, you must send a copy to the Tarlton Law Library as a record. If you wish to publish an entire document from the Tom C. Clark Papers, you must obtain permission from the Tarlton Law Library. Born in Dallas, Texas, September 23, 1899, Clark received his law degree from the University of Texas in 1922. He joined the Justice Department in 1937 and rose through the ranks. President Truman appointed him U.S. Attorney General in 1945. In 1949, Truman appointed Clark to be an Associate Justice of the U.S. Supreme Court. Clark resigned from the Court in 1967 when his son Ramsey Clark was appointed Attorney General, and afterwards sat on the Courts of Appeal in all eleven U.S. Circuits and in federal district court. On the court, Clark was a staunch supporter of civil rights. He was also well-known for his support of anticommunist policies during the Cold War. Clark's greatest legacy is in his tireless efforts to improve judicial administration. He chaired several American Bar Association committees on judicial administration, helped found the National Judicial College, and was the first director of the Federal Judicial Center. In his remarks at a 1985 symposium on the Tom C. Clark Papers, UT Chancellor Mark Yudof said of Clark, "In life, he awakened a generation of lawyers and judges to their professional responsibilities."